other public figures, the possibility of personal attack during a road journey or ceremonial drive cannot be ignored. Some kind of armoured vehicle is clearly the answer. But, until recently, the choice lay between military-style, heavily armoured personnel carriers, with no pretentions to personal comfort or dignity, and converted luxury saloon cars, offering little versatility in terms of off-road performance. The Discreetly Armoured Range Rover is a superb example of British Engineering at its brilliant best. Here is all the style, distinction, luxury and personal comfort inherent in the Range Rover concept with high levels of protective armour and a wide choice of security systems. 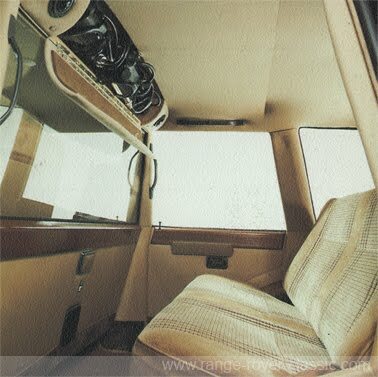 The unique, high ride position of the vehicle, provides the obvious advantage of superior all-round vision over crowds, traffic or other obstacles. Outstanding four wheel drive performance over any terrain, together with rugged power and generous ground clearance, allows for sudden change to off-highway driving when meeting the unexpected. position affords the driver and passengers commanding all-round visibility. a massive box-section chassis - all these combine to provide unparalleled standards of cross-country performance which have to be experienced to be believed. 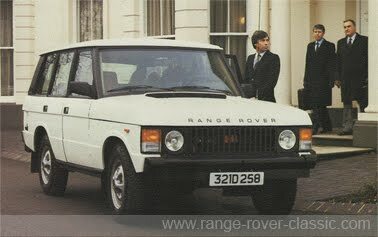 To the outside observer, there is little evidence that this is anything other than a normal Range Rover, selected for its distinctive elegance and international status. Appearances can be deceptive. The four wide-opening passenger doors and twin rear doors, together with all other vertical body panels, are backed by 5 mm armour steel. 3 mm armour steel is fitted to the roof and floor. The fuel tank, fitted with an explosion suppression system, is protected against bomb blast. An optional, gravity-fed, 2 litre back-up fuel tank is designed to allow operation of the vehicle for a short distance to clear the immediate area in the event of fuel system damage. 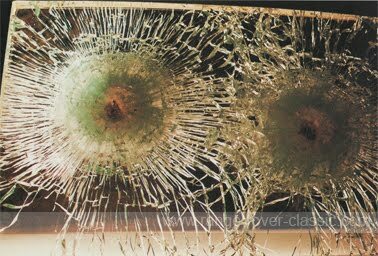 The Range Rover's fixed windows, front and rear screens - crystal clear in appearance and visibility - are in fact 35 mm bulletproof multi-laminates of glass and polycarbonate, capable of withstanding determined attacks. And, to allow safe communications with the outside world, a speak-out/speak-in system is fitted. Discreetly Armoured Range Rovers will ever be built and equipped to a common specification. The range of optional systems and equipment is extensive, covering luxury, comfort, security and protective items. An electronic tamper-detection system can be specified. Looking rather like a stylish encircling spoiler or skirt, this sophisticated system continuously monitors the underside of the vehicle. 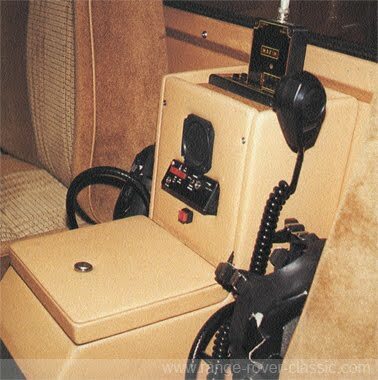 Should anyone attempt to place an explosive device beneath the Range Rover (perhaps whilst it is unattended), or interfere with the underside of the vehicle in any way, area mapped lights on a pocket-size portable handset flash a warning. 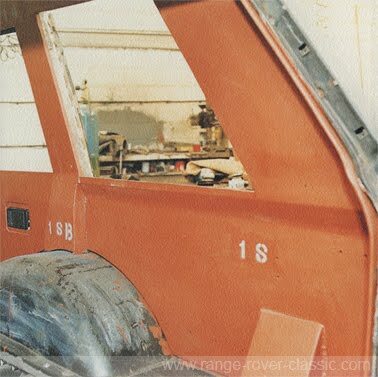 The 20 mm overlaps on the doors and the armoured overlaps on apertures are features of all Discreetly Armoured Range Rovers. To complement these, in the event of gas attack, an emergency oxygen supply with pull-down face masks can be fitted. Semi-automatic fire extinguishers can be positioned within the engine compartment and/or under the floor. These are remotely operated from inside the vehicle, where an additional portable fire extinguisher is normally located. If required, a powerful siren and/or a loud hailer system can be specified. For privacy and added security, many customers will opt for the fixed and fully glazed partition which can be installed between the front and rear seats. Although not constructed from armoured glass, this screen effectively isolates the driver and an efficient push-button two-way intercom is an integral part of the option. This brochure explains the features which are normally built into Armoured Range Rover vehicles. required is adequate for their own security purposes. Land Rover will be pleased to discuss special requirements. The Discreetly Armoured Range Rover - high-style security - on and off the road. Eight cylinders in vee formation, aluminium construction with five-bearing crankshaft and self-adjusting hydraulic tappets. Electronic ignition. Bore 88.9 mm (3.5 in). Stroke 71.1 mm (2.8 in). Cubic capacity 3528 cc. Automatic - Automatic gearbox with manual override and kickdown operation. Front and rear drive permanently engaged via a lockable centre differential. Front axle - spiral bevel with enclosed constant velocity joints. Rear axle - hypoid with fully floating shafts - Salisbury 8HA. Long travel low rate coil spring suspension. Developed to improve handling and cater for additional load resulting from armour protection. Power assisted steering with damper and safety column. 3.2 turns lock to lock. Runflat design with tyre retention capability. Tyres: Michelin XCM + S4 - 215 R16 PR6. Zenith-Stromberg carburettors via an electric pump. 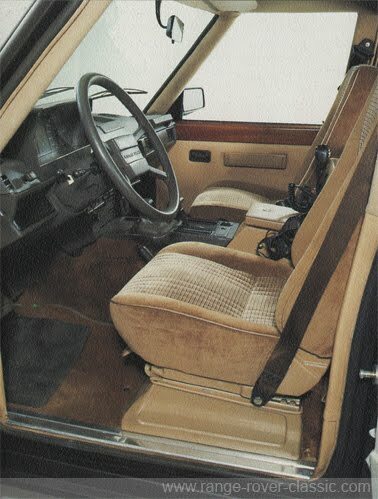 4-door access to seats. 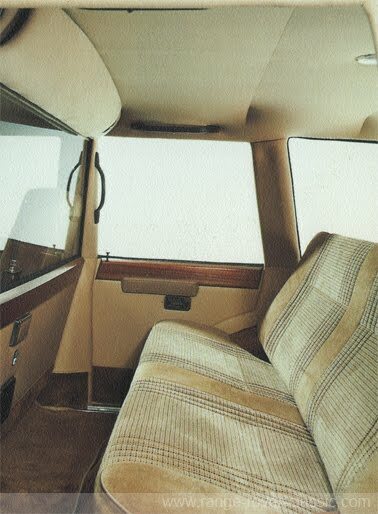 Front seats feature recline and height adjustment. Rear seat accommodates two passengers. Seatbelts have adjustable top mounting for optimum comfort. Main binnacle incorporates speedometer, tachometer, fuel gauge, water temperature gauge, odometer, trip distance meter and a fully comprehensive bank of warning lights. 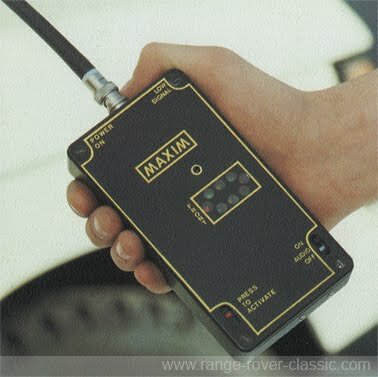 12 volt negative earth system incorporating 65 amp output alternator, battery reserve capacity of 180/78/89 A/min/V (55 AH). Behind rear seat: 1.02m3 (36.18 ft3). Maximum permitted -1200 Kg Front - 1850 Kg Rear - GVW 3050 Kg. Pressed steel body frame. Outer body panels generally of lightweight, rustproof aluminium alloy. (subject to variation at customer's request). 5 mm lightweight armour steel fitted to opaque vertical surfaces, such as sides, rear, front bulkhead, sills, etc. a) 7.62 x 51 Nato ball L2A2 MV 2750 fps. from 40 metres. b) 5.56 Armalite ball M193 MV3185 fps. from 75 metres. 3 mm lightweight armour steel fitted to roof and centre section of bulkhead. a) As (a) and (b) above, but angle of attack 50° to normal. b) 44 Magnum from 10 metres at normal. 3 mm blast steel armour fitted to floor. Capable of withstanding L2A2 grenade with no secondary missiles. MV2750 fps. 2 shots with 250 mm spacing from 30 metres. Extra door hinges and reinforced mounting pillars. All armour fitted together to give roll-over and crush protection. All windows fixed. Speak in/speak out intercomm system provided. Electric windows, opening to 10 cm maximum, are optional. Fuel tank protected by explosion suppression system and 3 mm steel blast material.